This is a name derived from the Gaelic, "Macaphersein", meaning "son of the parson". The old Celtic church had married clergy, and the Clan Mac Pherson is believed to have been founded by Muireach (or Murdo) Cattenach, who was a priest of Kingussie in Badenoch. 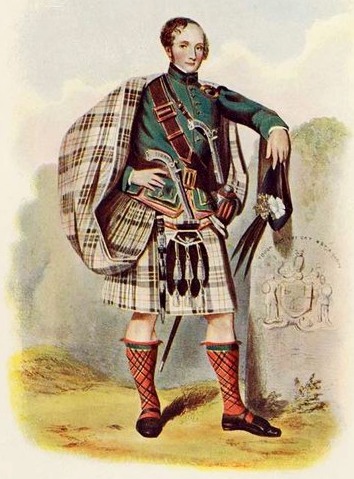 The Mac Phersons formed part of the great Clan Chattan Confederation. In the first half of the ninth century, Clan Chattan was led by a chief called Gille Chattan Mor, one of whose sons was forcibly resettled in Lochaber by Kenneth Mac Alpine around 843. The chief would appear to have been named in honour of St Cattan, and may have been the lay prior of Ardchattan in Lorn. Mac Pherson tradition has it that in 1309 Robert the Bruce proposed granting the lands of Badenoch to the chief of the Mac Phersons (perhaps Ewan Ban Mac Mhuirich), on condi-tion that he destroyed Bruce's enemies, the Comyns. They carried out the king's wishes with alacrity. Ewan Ban had three sons: Kenneth of Clunie, lain of Pitmain and Gillies of Invereshie, and the Mac Phersons are some-times known as the Clan of the Three Brothers. In 1370, a raiding party of Camerons lifted cattle from the Clan Chattan lands. They were confronted at the junction of the Rivers Spey and Truim at Invernahavon by the Mac Phersons, Mackintoshes and Davidsons. An argument arose between the Mac Phersons and the Davidsons as to who should take the right wing, traditionally the place of seniority or honour. Mackintosh adjudicated in favour of the Davidsons, whereupon the Mac Phersons refused to take part in the battle. The Camerons were apparently gaining the upper hand when the Mackintosh sent his bard, posing as a Cameron, to taunt the Mac Pherson for cowardice. The Mac Phersons soon charged into battle, and the Camerons were routed. The feud between Clan Chattan and the Camerons continued for many years. In 1396 a battle of champions was fixed to be held on the North Inch of Perth before Robert III and his whole court, and Sir Walter Scott gave a vivid description of this bizarre encounter in The Fair Maid of Perth. Andrew Mac Pherson, reckoned as the eighth chief, acquired the abbey-castle grange in Strathisla in 1618. His son, Euan, was a great royalist, and fought with Montrose dur-ing the civil war. Duncan Mac Pherson of Cluny, the tenth chief, losthis daim to lead Clan Chattan in 1672 when the Privy Council and the Lord Lyon, King of Arms, ruled in favour of a Mackintosh. As Duncan had no sons, he was succeeded as chief of the Mac Phersons by Lachlan Mac Pherson, fourth Laird of Nuid, in 1722. His son, Fuan of Cluny, became a famous Highland leader in the Forty-five. During the retreat from Derby he defeated a numerically superior force at Clifton Moor in West-morland. After the defeat at Culloden, Cluny was able, through the faithful support of his clansmen, to escape capture by Hanoverian troops for nine years, despite a reward of £1,000 for his capture. He finally escaped to France in 1755. Touch not the cat without a glove . (son of the parson) .